How do I magnify or zoom my screen? Providing Mac help to my mom and all the moms of the world. It could be advancing age, but more and more I’m feeling the need to zoom in to see things better on my Mac display. It’s not the display’s fault. They’re getting better and better, packing in more and more pixels for gorgeous, crisp photos, artwork, and text. But that often means that, either by design or accident, letters and images on the screen get smaller and smaller. My eyes grow weary from more and more time in front of the computer and research that shows our backs are better off if we lean way back in our chairs, putting the display even further from my eyes. Fortunately, the Mac offers a few ways to zoom, either your whole display or just a window. In this video I show you a few of those ways. That’s just the basics of screen zooming. You can find lots of settings to play around with in System Preferences. Choose its “Universal Access” option, then the “Seeing” tab. In the “Zoom” section you’ll see an “Options…” button. Click it and you’ll see all these options. 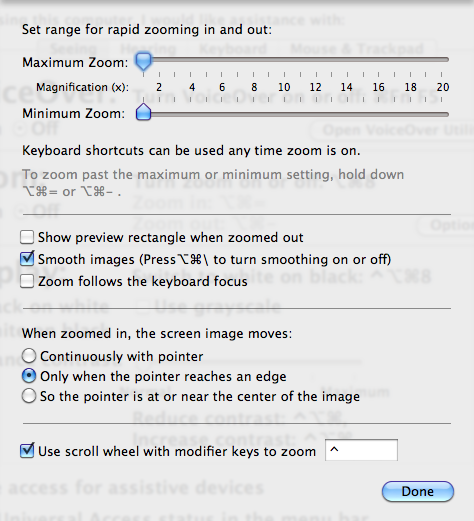 As you can see, there are numerous options to let you fine-tune your zooming to just how you like it. Some applications, especially web browsers like Safari, Firefox, Chrome, etc., offer a simple way to zoom in and out on whatever you are viewing in a window. What’s nice about this is that you can leave that window zoomed in for better reading without affecting the rest of your display. Even though it’s written and easy to think of as ⌘+, you don’t have to hold down a “shift” key as you would if you were typing a “+”. It’s just easier to think of zooming in with a plus sign than with an equals sign. Finally, after zooming in and out to your heart’s content, if you want to reset the zooming back to normal, use the “Actual Size” command that is also found in the “View” menu. As with ⌘+ and ⌘- I just remember that the “Actual Size” keyboard shortcut is ⌘0 (as in, “command” “zero”). Whether you choose to zoom your entire screen or just your window, you have control over the size of things on your Mac display so gives your eyes a break and just zoom! Awesome. Thank you so much!!!!!!!!!!!!!!!!!!!!!! Steve, Mom here. This zooming in and out will come in handy. Some websites have such tiny print I “DO” find myself hunching over the computer to read the print. Thank you. This zooming was very helpful, but is there a way to permanently set the size of the print so you don’t have to constantly zoom? Good post. A lot of people can use this information. Since so many people don’t know it, I want to add buttons to my websites that let people magnify their view by pressing the button. Essentially – a button that triggers the magnification command. You wouldn’t know where to find a tutorial on that would you? Hi Gary, although what you describe sounds like it should be simple, it’s actually quite challenging, made even more complex by the variety of web browsers and also variety of devices like smartphones and iPads. Here are a couple ways to do something like this. https://www.handycss.com/tutorials/2-techniques-to-make-zoom-buttons-in-css/ You can find more by Googling for things like “web page zoom button”, “web page magnification”, etc. THANK YOU!!!! I was wasting so much time online trying to figure this out!!! This was a save for me. I spend a day or so trying to find how to zoom with Mac and this website was very informative and simple. Thank you for the information. Your name will be displayed with your comment. Your email address will not be displayed and we will not share it with anyone. Previous post: What is good email forwarding etiquette? Get Mac Help For Mom's free email newsletter.